Sunday February 18th 1894 I went to church alone in the morning. After dinner Will took me over the river in the buggy. We went to Woolfs first. I got four jars of soap at home. We went to church in the evening. Dr Brush' father preached. 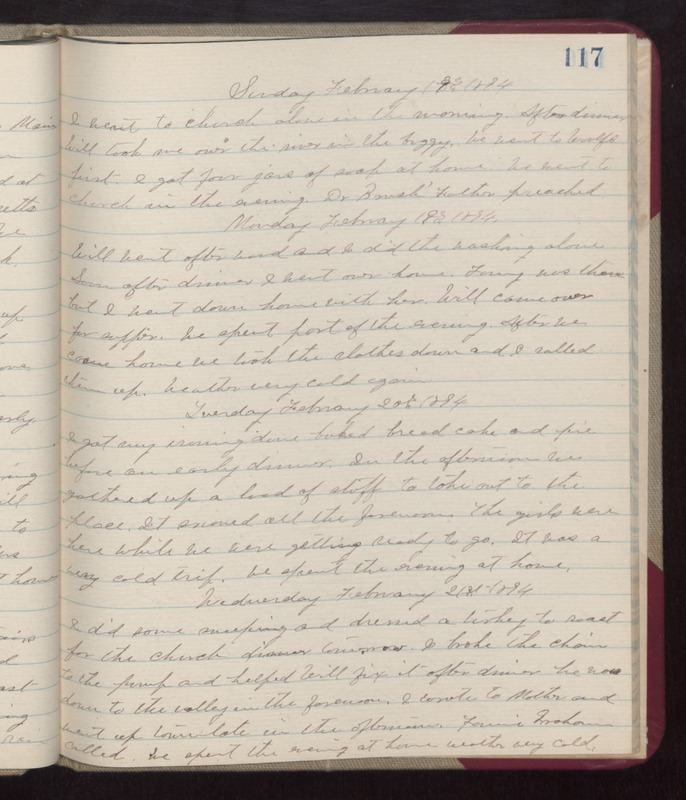 Monday February 19th 1894 Will went after wood and I did the washing alone. Soon after dinner I went over home. Fanny was there but I went down home with her. Will came over for supper. We spent part of the evening. After we came home we took the clothes down and I rolled them up. weather very cold again. Tuesday February 20th 1894 I got my ironing done baked bread cake and pie before an early dinner. In the afternoon we gathered up a load of stuff to take out to the place. It snowed all the forenoon. The girls were here while we were getting ready to go. It was a very cold trip. We spent the evening at home. Wednesday February 21st 1894 I did some sweeping and dress a turkey to roast for the church dinner tomorrow. I broke the chain to the pump and helped Will fix it after dinner. He was down to the valley in the forenoon. I wrote to Mother and went up town late in the afternoon. Fannie Graham called. We spent the evening at home. weather very cold.